Remember Fruitopia? It was a sticky-sweet, non-carbonated soft drink distributed by Coca-Cola in the early 1990s. Unlike its counterparts Capri Sun (which promoted a pouch-lancing beach bum lifestyle) and Hi-C’s Ecto Cooler (which invited too many questions about what becomes of juice drinks in the afterlife), Fruitopia, with its kaleidoscopic iconography and hippy-dippy ethos, offered a quirky yet refined alternative. You can also find this outsider spirit in the artwork of the CTI label, a jazz-centric subsidiary of the legendary A&M. Work Drugs keyboardist Ben Louisiana sifts through a trio of CTI releases by the late trumpeter Freddie Hubbard, making note of the LPs’ covers. Of Red Clay (1970) and First Light (1971), Louisiana praises the moody and hazy design. 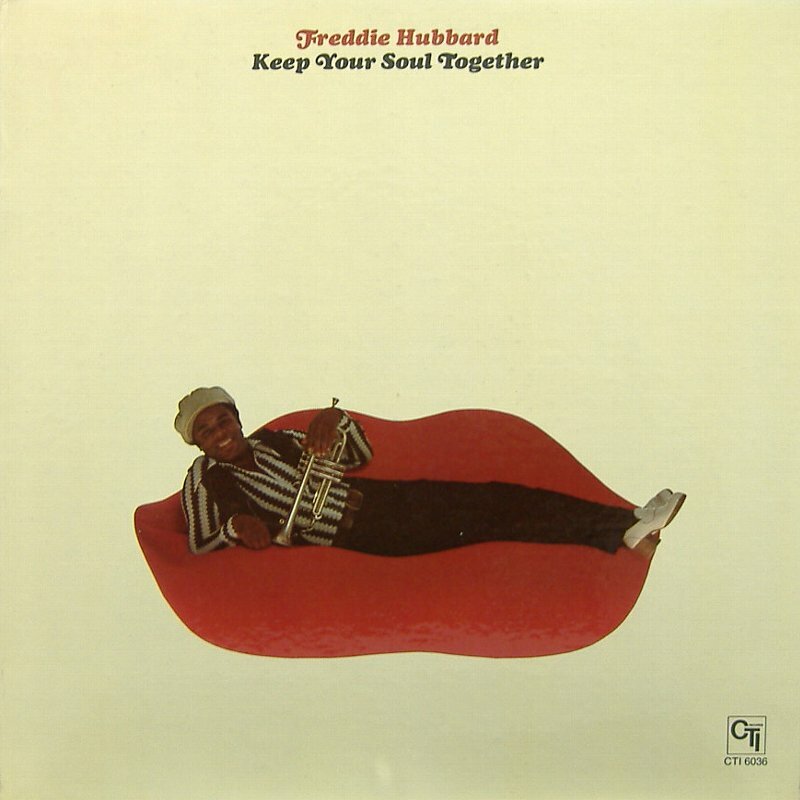 But it’s the cover art of 1974’s Keep Your Soul Together, featuring Hubbard reclining on a couch shaped like an oversized set of plump red lips, which garners the most visceral reaction. Behind Louisiana, black and white photographs of musical heroes dot the wall leading up the stairs of Work Drugs’ Port Richmond headquarters. Under the protective gaze of Ryan Adams, Thom Yorke and Neko Case, The Key’s John Vettese and I are led up to the top floor. A metal utility ladder cascades down in the middle of an otherwise nondescript room. Above is the roof deck. Hand carved by Louisiana’s own father, the deck is a raft-sized expanse, flanked by neighboring houses’ spindly TV antennae. Louisiana informs us that we’ll shortly be joined by guitarist Thomas Crystal and bassist Mr. Kansas City. Conversation drifts from discovering band members’ secret talents (guitarist/singer Katie Nicks has apparently played the alto saxophone for 14 years, and Crystal can write poems in different languages simultaneously with each hand*) to how many times you need to listen to the new Ariel Pink album before you ‘get’ it (answer: six). Crystal and Mr. Kansas City arrive just as Louisiana unveils the beginning stems of a Spotify playlist. A “playlist nation,” that what he calls today’s world of music consumption. Just like a club DJ pushes and pulls his audience from the bar to the dancefloor and back, Work Drugs have been indeed working to establish rapport with their fans before springing the side-long experiments on them. It’s a matter of courtesy, really. The breeze on the roof deck is tremendous. Louisiana remarks that it’s always like that. Nearby, I-95 provides a soothing, oceanic hum. John and I are invited to make our own contributions to the playlist; the only caveat being that the songs somehow fit under the blanket of ‘summer.’ That no one definition of ‘summer music’ can be settled on is ultimately rewarding. Crystal recalls a long night on the road in which he nearly fell asleep at the wheel. His salvation came in the form of a friend’s self-consciously cliché classic rock playlist. Mr. Kansas City’s face lights up, and he suggests “School’s Out,” reimagining Alice Cooper’s mid-June anthem as a battle cry for sophomores. Not having my own premium account, I have to be shown how to add songs to the playlist. In no time, I’ve found several tracks to blast through the portable speakers. The intense bass of Junior Murvin’s “Police And Thieves” is a bit much, and the speaker cones rattle and rumble. Any track that does that to your sound system must be a summer hit. We learn that Work Drugs have a sizeable following in Poland. Not surprising, given the Central European-friendly nature of their music. We talk business models. How to press a greatest hits album for a limited run. What are their greatest hits? The guys play characteristically coy and are reluctant to divulge details. We ponder the process of getting a ‘Verified Account’ on Twitter, and Mr. Kansas City reveals himself to be a member of the Musicians Union Local 77. A medley from Sam Cooke’s Live At The Copa LP churns as a yellowjacket crawls around Crystal’s iPad. John and I have kept the Philly CarShare vehicle too long. What’s the moral? There must be a moral. The moral is that Work Drugs’ new album, Absolute Bearing, is out now, and they will make a rare live appearance this Friday night at Johnny Brenda’s with City Rain and Cold Fronts. Tickets are $10 for everyone. *Note: There’s a chance I’m getting Louisiana’s skills confused with those of James A. Garfield, 20th President of the United States.